The universe of Breaking Bad has always been a closed or ‘finite’ system (as Vince Gilligan hammered home in his comments on Talking Bad the other night), and the finale bore this out in a remarkably confident manner, with Gilligan giving the last word to Badfinger’s Pete Ham, who sings “Guess I got what I deserved” over Walt’s dead body. Indeed, deserving was the moral engine of the show from beginning to end, the reason why some have described the series as ‘Old Testament-like’ in its approach to good and evil. So we knew that Walt would not ‘get out of this world alive’, at least not if Gilligan’s vision held true. And it did! Even at their apex, Heisenberg’s intelligence and ingenuity–as impressive as they have always been–were never going to be enough to ensure his escape or triumph. Yet the ending was not a bland or predictable statement of cosmic retribution, and therein lies the art–and catharsis. Yes, Walt pays with his life, and yes there is a sort of blood atonement at work when it comes to Jesse–but it flows from the only place it could have ever flowed from in Gilligan’s universe: repentance. This is an episode, after all, that begins with the “all-powerful” Walt uttering a helpless prayer–by no means a ‘righteous’ prayer (if there is such a thing) but a prayer nonetheless. And if the God of Breaking Bad is an avenging one, then perhaps it should be no surprise that his plea is answered. In a New Hampshire blizzard, Walt’s self-justifications finally come to an end, and the moment he asks for help become the moment he is freed to follow the forgone conclusion of his death to the only possible shred of redemption available to him. This is what separates him, momentarily, from all the machinations around him, which he so brilliantly exploits. Suddenly his immortal words about “I am the one who knocks” are stripped of their delusion and inverted, and he becomes an instrument of the justice–or, more accurately, the judgment–that has dogged him at every turn, rather than its target. Yet Gilligan reaches for something other than justice in those closing scenes. Walt’s moment of self-sacrifice, where he throws himself on Jesse, may not have been as spontaneous as some claim (I am convinced it was part of the plan, rather than an improvisation), but it nonetheless rings true. It does not negate the consequences of his “choices” but instead absorbs them, harkening back to Jesse’s “problem dog” speech from season four. Some might sniff and say the whole thing feels a bit too watertight, both morally and plot-wise, but Breaking Bad was never an exercise in ambiguity. Still, none of this would matter much if the episode, and series itself, hadn’t been, er, executed with such breathtaking precision, from the cinematography and set-design to the acting and writing. That is to say, regardless of the theological and spiritual implications, this is modern storytelling (and filmmaking) at its absolute finest and most satisfying. I am grateful we got to go for such a rich “ride along”. -Jesse Plemmons plays it brilliantly right to the end. His family and cohorts all lying dead around him, yet that final “Mr. White-” has nothing of the ‘why’ in it, only an awestruck ‘how’. Or even, ‘wow.’ Todd is the unsung masterpiece of this final season, a corn-fed but equally chilling Marlo to Gus Fring’s Stringer Bell. -If you know the whole Badfinger story/tragedy, the irony only deepens. Such an inspired choice! I bet Gilligan had it in mind for years. -“New York. Sante Fe. Prague. Wherever”. And the lines that come out of those unwitting Schwartz mouths before they see WW are some of the funniest and most biting of the whole series. -Walt singing while he sets up his trunk contraption is another masterful touch. As is Todd’s Lydia ringtone…. 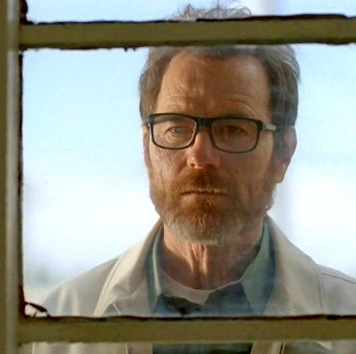 The final season asked viewers to locate the place in themselves where they once connected to Walt, then realize just how far he had fallen, then realize that every person has this sort of darkness within them. In practice, it resembled the concept of original sin. All fall short, not just of the glory of God, but of a better, more loving world…. If you don’t want to discuss this show in religious terms or via Christian theology (and I don’t blame you), let’s take this all the way back to the idea of the anti-hero. On his surface, the anti-hero is a selfish creature, looking out only for himself, though perhaps having a pang of guilt about it here or there. Old anti-hero shows coded this at least somewhat in terms of it being vaguely exciting or fun, and Breaking Bad did that for a while. But as time went on, that became more and more empty, more and more hollow. Both in its message and in its late 2000s milieu, Breaking Bad became more brazenly about what it means to care only about yourself, to leave behind ideas of connection and community in favor of material ends. It was the embodiment of the old idea of “I’ve got mine, so [$#@!] you,” taken to its logical extreme, just as much as it was a salting of the earth for the anti-hero genre. Yes. Beautiful analysis.Thanks for this, David. Yes! Also, I’m glad I’m not the only one that saw the rescue of Jesse as part of the plan, not as improvisation.